I’ve going down a long path to try and merge buddypress and wordpress “edit profile” pages. Long story short, I’m trying to keep users out of the back end entirely if I can, but they need to be able to edit their wordpress profile somewhere, and logically, it ought to be with the other “edit profile” stuffs. Profile builder allows me to put a shortcode anywhere in order to allow somebody to edit their profile in the front end. I need to insert this shortcode into a new “field group” in “xprofile custom fields” but I can’t just drop in a shortcode there, only editable fields are permitted – furthermore, if I put any editable fields into the “field group” then that group will have a save button as well as the one produced by my shortcode! Any suggestions? Also willing to entertain a different suggestion altogether. Members are the heart of BuddyPress, which is a plugin. Once BP is activated, your user haven’t to go to their dashboard, as anything can be done from front-end. If you need wp’s bio field, you could recreate one with xprofile. Suggest to read the Codex to understand how BP is working. And if it’s not enough, see this plugin (but probably only usefull if you had a wp install running with many contributors before using BP). Okay, that’s a good start – I’ve installed BP XProfile WordPress User Sync, but there are several critical wordpress account fields inaccessable from BP. These are critical, as people change their emails and passwords – and there is no way to do this right now through BP as is. From there they have access to the WP fieldss and to the extended profil fields. From there, they can change email & password. Admitting you closed admin access to all users, the only other way for them to modify there email and password is to use the “forgotten your password ?” at loggin stage. All this is not really a BP thing, but how WP is working since 2003. The 3 mandatory field (username, email and password) belonging exclusively to WP. They are showed on registration, ASIDE BuddyPress custom fields. BP doesn’t exactly handle them, it only show them. And as these fieds are WP territory and a bit sensible, they are not accessible from within frontend profile settings. Guess the word “critical’ is a bit exagerated. Not every user change his mail or password every day. How long do you wait for a new phone number or new electricity supply ? Probably more critical things as a mail/password change ! This is probably a bit of a noobie question, but is it possible for a plugin to expose the changing of the email and/or password on the front-end and be able to change it on the back-end? I’m looking for the best way to restrict a user from accessing any part of the wp-admin arena, inluding the user’s stock WP profile page. Am I dreaming here, or is this possible? I am about to dive into the Profile Builder plugin to see if I can get it to do what I want, but I’d like to save that time if nothing will come of it, etc. i’ll try to explain. You’re using WordPress and a plugin called BuddyPRess which add a community dimension to WP. Members are the heart of BP. Anything done by the plugin will return something related to members: activities, friendships, dicussion and much more. Because WP let you register members separately. To do this, WP ask for a username(pseudonym), a password and a valid email. You cannot avoid this, whatever plugin you use. It is how it works. Now, we have 2 different question in this topic. 1) how to restrict access to profile settings ? 2) do we need a plugin for that ? owner/builder… This changed with the years and today, you can handle a multiauthor blog. When you install BP, you can still handle a multiauthor blog (or even blogs) and also a big community of different users, whith different (wp) roles. What hasn’t changed is the way WP handles authors(or members): from within the dashboard, whatever the role. When BP is activated, and if you use the xprofile component, you can build a registration form who is added to the original wp registration form. This form is then available on each user profile and can be modified from there. To restrict user access to wp-admin, you can use different technique. This depends of your coding knowledge or working philosophy, with custom code or applying some plugin solution. This is independant of BuddyPress and out of the scope of this forum. Just remember that BP let you access to your credentials from front-end. – you always need to read about a plugin before using it. For example, the workaround mentionned in this topic about the usage of Profile Builder. – here a recent tutorial – for beginners – you may found more advanced advice by googling about “wordpress restrict dashbord access”. When you read the teaser on that plugin page, you already should have understand that you don’t need it ! 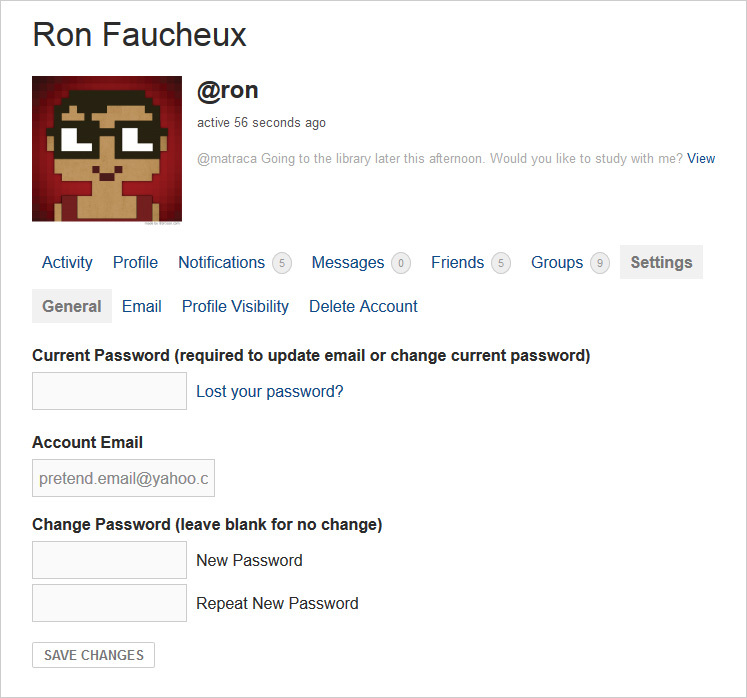 Simple to use profile plugin allowing front-end login, user registration and edit profile by using shortcodes. Astonishment ! BuddyPress offers exactly the same options (among others). What ever plugin you use, the regiter process of WordPress won’t change, and the user list or the user data will always be at the same place. What plugins do (most of them), is to modify the appearance of that process. What you can also do is to remove all WP related items from the toolbar, if you use it. This is widely documented and discussed on WP’s support and codex. It’s WP territory and has nothing to do with the fact you use BuddyPress. Admitting you found a solution for the backend, you need to use BP’s login widget. From there, users can enter the site. And if they loosed their password, they can ask for a new one from there (usually the sidebar, on front-end). Obviously I’m a bit of a noobie to WordPress (I’ll admit, so feel free to flame away ;)), but I’d like to ask about your reference to the clause “When BP is activated, and if you use the xprofile component…” I am a bit confused about “the xprofile component” and was wondering if you can help me understand it a bit better. I am fully cognizant of the fact that one can preclude access to the WP Dashboard in a number ways, including by Role, etc., and I plan to do that. However, that causes me to provide exposure to the standard WP Profile fields (or as many of thsoe fields that I want to expose, that is) so that the user can modify them. This includes the critical email and password fields. Relating to this situation, you didn’t quite address my key question as to whether it is possible (without serious WP core hacking — something I would NEVER do, btw) to effect the change of either the email or password fields? Now listen, I realize that probably sounds like a shameless noobie question, but it really begs the question of whether modifying the email/password fields outside of the WP dashboard is considered “bad form” in some way. Thanks in advance for your advice and insights. it is possible […] to effect the change of either the email or password fields? Yes it is ! from here: your-site.abc/members/USERNAME/settings/ – the link can be found under the top right usermenu on wp’s toolbar: username > settings > general OR/AND on the buddymenu, when you’re on your profile: Settings ! And that’s it ! For all other BP related questions, please read through the codex, i really have no time to (re)write all explanations. Sorry, hope you uderstand. The topic ‘[Resolved] Merging Buddypress Profile with WordPress Profile’ is closed to new replies.